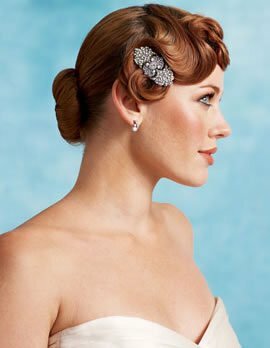 What makes a vintage hairstyle? When fashion works in cycles, can you really call a hair style, or hair cut vintage? If it’s fashionable because it’s old, doesn’t that make your vintage hairstyle modern? Ultimately this cycle of old becoming new means that little alterations to classic looks helps vintage styles get a breath of fresh air and a burst of new life. Vintage hairstyles can be from as far back as the 1800’s. The Gibson Girl hairstyle, a loose, frothy bun piled on top of the head, is a classic look that flatters most face shapes and gives a mature, business like look without being too severe. If you’re looking for something more dressy, try a soft curled bun where sections of the hair are curled over a wide-barrel curling iron and then pinned up into place on top of your head. Long hair is always in fashion, but short hair can be vintage styled as well. Consider the blunt bob, a fashion statement from the 1920’s. If that’s too severe for your preferences, go with something softer like the pixie; this style has been around since the sixties! Men don’t have to be left out in the cold when it comes to vintage style either. All they have to do is take a picture of an iconic haircut to their stylist and ask to have their hair cut and styled similarly. A good stylist will be able to recreate the look and teach you how to keep it looking good!